Jesus came to Sychar, a city of Samaria, near the piece of land Jacob had owned (John 4:5; Genesis 33:19). The territory was apportioned to the descendants of Joseph, and Joseph was buried there at Shechem (Joshua 24:32). It was a place of great historic importance. We are not able to speak with certainty regarding the location of Sychar. Some scholars associate the site with Shechem; others think it should be identified with the village of Askar which is located a short distance north. The traditional Jacob’s Well is located at Shechem in the valley between Mount Gerizim and Mount Ebal. The modern town of Nablus now fills this valley. “Of all the ‘holy places’ of Palestine, none has more reason to be considered authentic than Jacob’s well. Indeed, there is no reason why its authenticity should be questioned” (Land of Christ 65). Parrot describes the water as “cool and pleasant-tasting…drawn from a depth of 128 feet.” I have drunk the water several times, but in the past couple of decades my guides have advised against it due to pollution in the area. The Samaritan woman said, “the well is deep” (John 4:11). Parrot reports the well is 128 feet deep. Murphy-O’Connor says it is 22.5 meters deep (about 74 feet). McGarvey cites several measurements mentioned in 19th century writers and reminds us that the well became filled with stones cast in by travelers trying to hear how long it would take a stone to hit the bottom (Lands of the Bible 283). He reports that the well was often dry. There are numerous springs in the area of Shechem. Jacob, as a late-comer to the region, might have found it necessary to dig a well to assure water for his family and cattle. 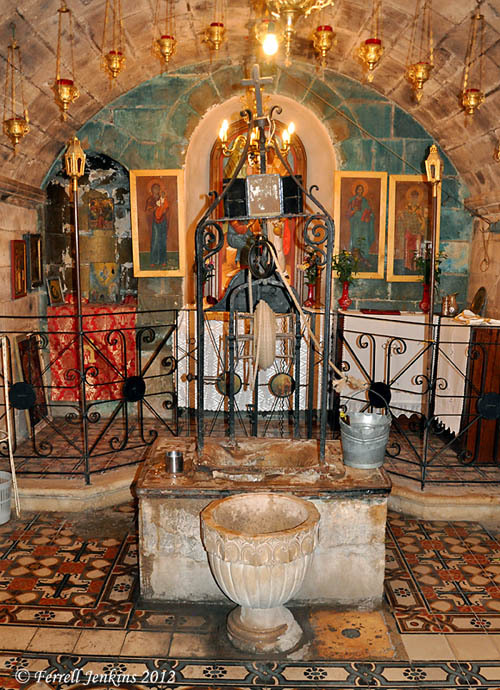 A church was erected over the well about A.D. 380. The Crusaders built another church on the site in the 12th century. 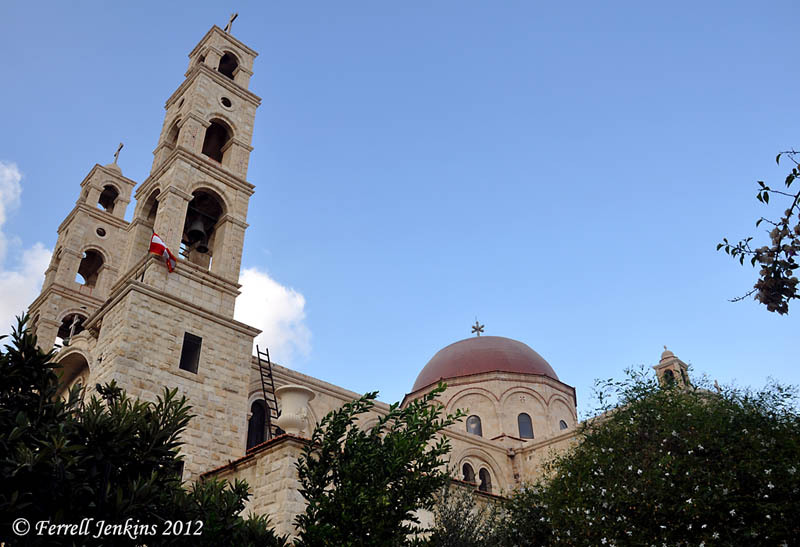 The property came under the control of the Greek Orthodox church in 1860. By the end of the 19th century the Greeks began a new church, but construction was halted during World War I. The new building was completed in 2007. This photo shows the towers and dome of the church today. New Greek Orthodox Church covering Jacob’s Well. Photo by Ferrell Jenkins. It has been difficult for groups to visit Jacob’s Well in recent years due to the situation in Nablus and the West Bank. Today we were able to visit the church and make photos. Jacob’s Well. in a Greek Orthodox Setting. Photo by Ferrell Jenkins. We had a nice day visiting Beth Shean, Spring of Harod (it was dry); Jezreel, Samaria, as well as Jacob’s Well. This entry was posted in Bible Places, Bible Study, Israel, New Testament, Photography, Travel and tagged Ministry of Jesus, West Bank. Bookmark the permalink.